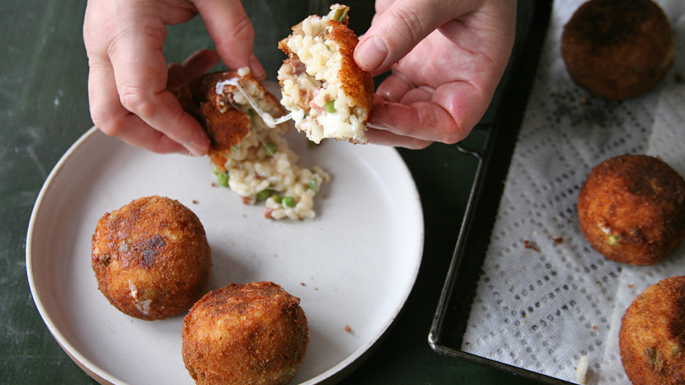 Rice Balls are a personal favorite of mine and a favorite appetizer all over Italy as well. Kids just love them, particularly when the hidden treasure at the center is savory prosciutto and a nice melted cheese. Pop these into your mouth and really savor them. Arborio rice is recommended in the recipe but this dish can be made with brown rice as well; just make sure you cook it long enough (you might need to use a bit more stock). And one final tip – you can also make these with left over rice, so absolutely nothing goes to waste. Warm the chicken stock in a small pot over low heat. Heat the olive oil in a medium saucepan; when the oil is hot, add the onion and cook until softened, about 3 to 4 minutes. Add the ham or prosciutto and cook a few minutes, until the meat begins to render its fat. Add the rice and cook to coat the rice in the oil/fat. Pour in the wine, bring to a simmer and cook until the wine is almost reduced away. Add 3 cups hot chicken stock and the salt; cover and simmer until the chicken stock is absorbed by the rice, about 7 to 8 minutes. Add the remaining 2 cups stock and cover, letting the rice cook until al dente, about 6 to 7 minutes more. If any liquid remains, increase heat and cook until all of the liquid is absorbed. Stir in peas towards the end and mix well, then spread the rice on a rimmed sheet pan to cool. When the rice is cool, put it in a bowl and stir in the grated cheese and chopped basil. Scoop out about 1/3 cup rice, roll into a loose ball, then poke a cube of mozzarella into the center. Pat firmly to form a tight ball around the cheese. Spread the flour and breadcrumbs on 2 rimmed plates, and beat the eggs in a shallow bowl. Dredge the arancini in the flour, shaking off the excess. Dip them one by one in the beaten egg, letting the excess drip back into the bowl. Roll in the breadcrumbs to coat thoroughly. Pour an inch of vegetable oil in a large, straight-sided skillet set over medium heat; it is hot enough when the tip of an arancini sizzles on contact. Fry in batches, taking care not to crowd the skillet, turning on all sides, until golden, about 3 minutes per batch. Drain the arancini on paper towels and season with salt while still warm.